Bring your friends, your music (on an iPod, laptop or CD), a cooler with your drinks and you are ready to roll. 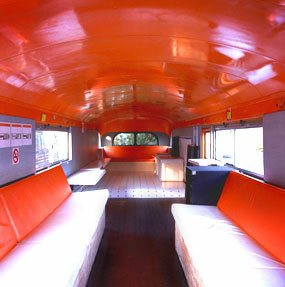 We encourage you to skip the bar-hopping and spend time on the bus itself. It has a dance floor and a sound system after all! We are happy to take you to Twin Peaks, Treasure Island, the Marin Headlands or Ocean Beach for amazing views. You will be surprised at the shift in perspective when you return to the city! Really, this is just the tip of the iceberg. The possibilities are limited only by your imagination. We can go to Napa for wine tasting or to Santa Cruz for surfing. The bus is only $900 for the minimum of four hours plus $155 for additional hours. Do the math: With 4 hours and 40 people you're at $20 each! For an additional fee we can also provide outdoor sound, DJs, food, and more. Trust us, this has proven to be a great and unique way to create memories.